This week we’re working with a very talented group of young people in Poplar in partnership with The Prince’s Trust Get Started. As well as writing some brilliant original music together – ready for today’s gig – yesterday they spent the day learning about how to create their own radio show! The called the station ‘Woody Radio’ and the show ‘The Tea’. If this all sounds wonderfully intriguing, why not check out the excellent show made by a group we worked with in Croydon in March below? This May we’re excited to be taking our Making Tracks programme to East London for the first time, working in partnership with the Prince’s Trust Get Started Programme, Morgan Stanley Centre in Poplar. We’re able to extend the programme to East London thanks to support from Arts Council England, the London Community Foundation, Comic Relief Dispossessed Fund, and The Mercers’ Company. We’d love for you to join us to enjoy a performance of original music, written and played by young people from East London on Friday 13th May at 6pm. 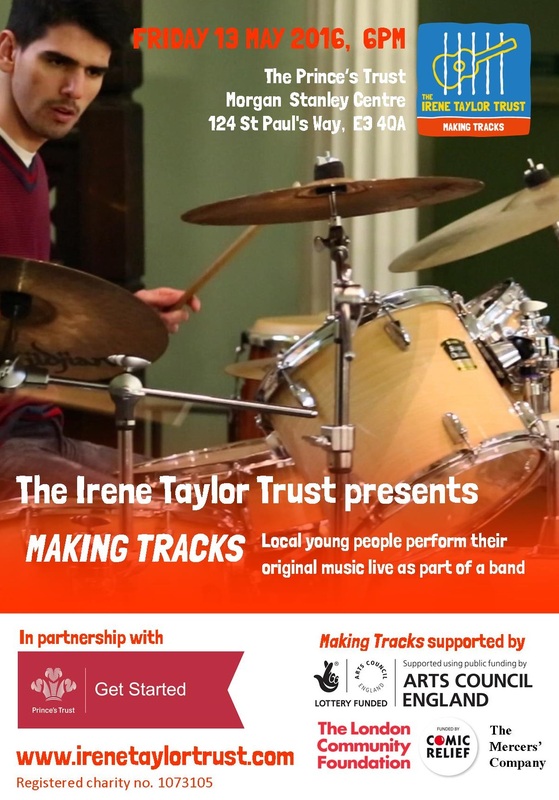 Over just 5 days, led by The Irene Taylor Trust’s project team, the young people taking part will learn how to play instruments, form a band and write their own original songs. After taking part in the intensive project, the young people will be given the opportunity to hone their new-found skills in series of special follow-on sessions. Suitable progression routes and further development opportunities for the individual young people will be identified by our Personal Development Manager. Bus routes 309 and 323 stop near the centre.